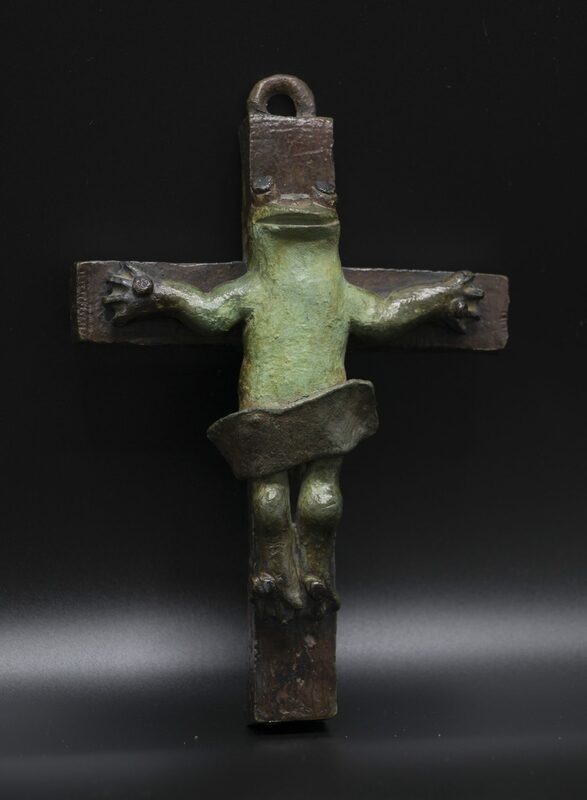 David Gilhooly Frog Affix, 1986 Bronze, 4" x 1.5" x 6"
Born in Auburn, California, Gilhooly graduated from the University of California, Davis in 1965 with a BA and in 1967 with an MA. 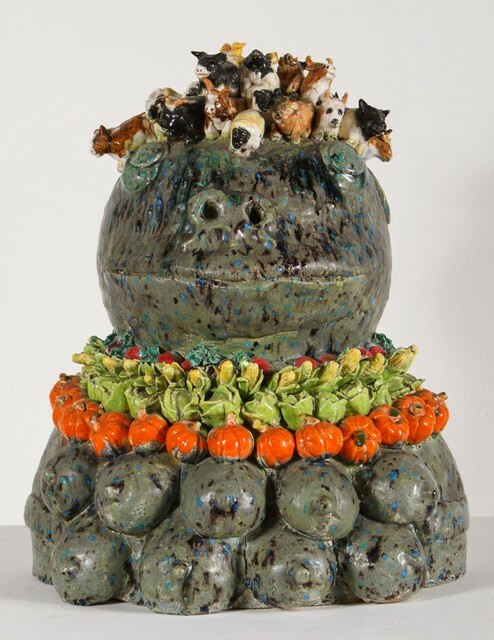 Gilhooly worked with Robert Arneson, Peter Vandenberge, Chris Unterseher, and Margaret Dodd, in TB-9 (temporary building 9) and together they created what was later called The Funk Ceramic Movement of the San Francisco Bay Area. Gilhooly left TB-9 for one semester to become Manual Neri’s assistant and began making art out of lumber, fur, neon lights and asbestos shingles. In 1969, Gilhooly took a teaching position at the University of Saskatchewan in Regina, Canada. He followed this, teaching for seven years at York University, in Toronto, Canada. In 1982, Gilhooly started exploring the medium of Plexiglas, but still produced a multitude of ceramic pieces. Gilhooly worked from a handful of humorous themes in pressing together a vision of the universe unrivaled in its insight and creativity. His distinctive frog world successfully bridged his passions for history, the physical sciences, and art. From the early days of his career, Gilhooly examined the world, past and present, through his frog-tinted glasses. His pointed examination of social and political realities resulted in characters such as Frog Queen Victoria, Frog Osiris, and Boris Frogloff, all depicted in stately busts. Soon after the busts came Gilhooly’s celebrated arks, strong vessels made with real nails that transported Gilhooly’s characters and themes throughout his work. Gilhooly’s work is in collections throughout the United States and Canada.